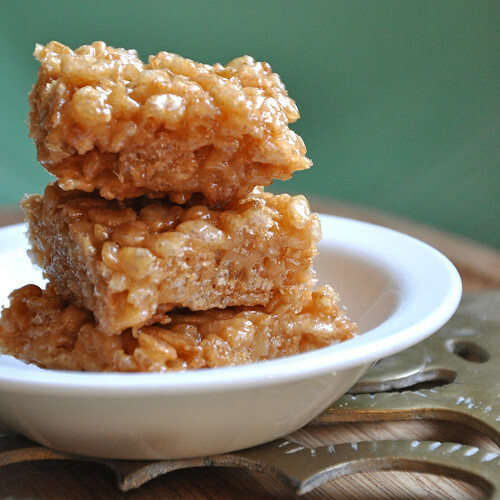 This recipe is super sweet and simple. 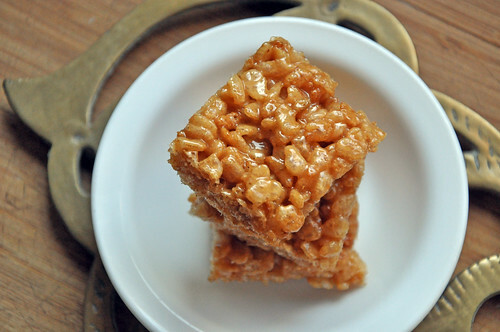 Rice Krispies Treats were one of my childhood favorites. Even better -- when mom would make them with peanut butter. But in the years since, I haven't bought much cold cereal. I've learned what goes into those fluffy white marshmallows. And I've been experimenting with far more adult flavors to fill up our dessert recipe section on this site. 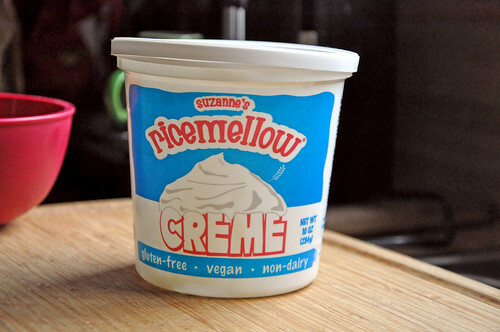 I've been meaning to try Ricemellow Creme (gluten-free, dairy-free, and vegan). So, when I saw a tub of it at GreenStar this weekend, I just had to pick it up. Originally, I thought it'd be good to plop into my hot cocoa. But the aisles in the coop are narrow . . . so when I moved over to let someone pass by, I found myself smack in the middle of the cereal section. Julie and Heather helped me locate the crispy brown rice (which, by the way, you can find in wheat-free, gluten-free varieties as well!). I honestly made these kid-friendly squares the minute I got home that evening. Now you can make them, too! 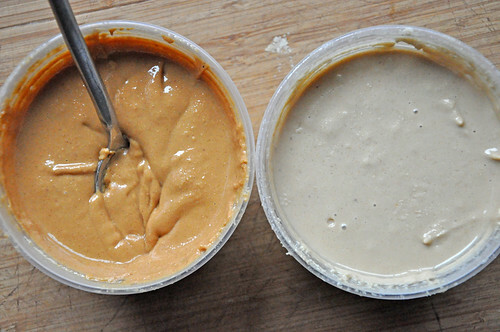 In a medium stock pot over low heat, mix together the Earth Balance and peanut butter. Stir until smooth and well incorporated. Toss in the ricemellow creme. Mix continually until it's all smooth. Stir in the vanilla extract. 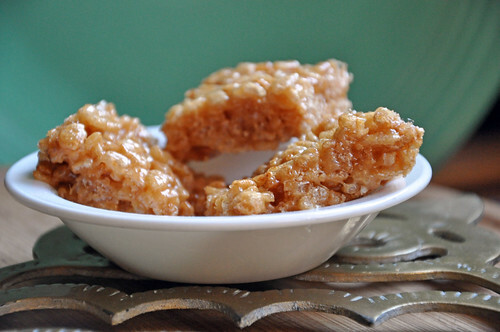 This is the asterisk part: If you want incredibly sticky, gooey squares, use 4 cups of cereal. If you want drier, crunchier squares, use 5 cups. 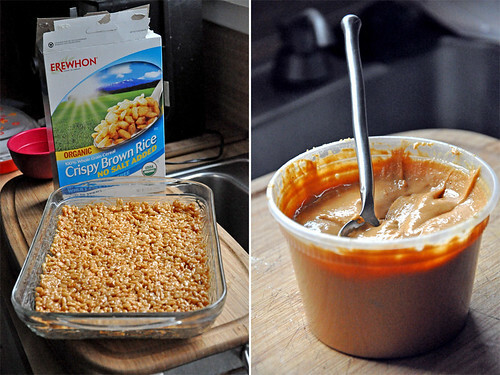 Whatever amount you choose, just toss the cereal into the pot and mix well with the mellow-peanut butter mixture. Would you believe me if I told you there are only two tiny squares left? Well, it's true! And would you believe me if I told you that Stephen probably only ate like one row? Also true. So, my diet has been a lot of calzones and crispy treats. Good thing I had a big salad for lunch! If you have a peanut allergy, I think this recipe would work great with a number of nut butters. Like cashew, almond, or even sunflower. Of course, I'd like to make some with Nutella. PS: At-home DP Dough calzone recipe will be posted tomorrow morning (thanks to the response to this morning's weekend recap post). 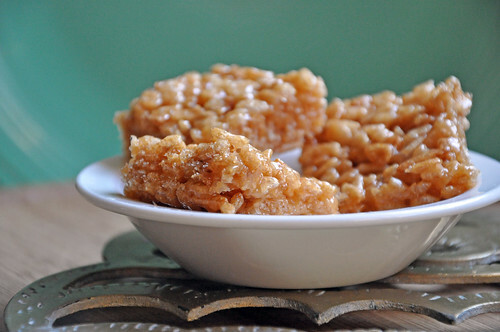 What was your favorite sweet snack when you were a kid? Besides these babies (which my mom would often layer with ice cream! ), I enjoyed the basics: Chocolate chip cookies, brownies, and peanut butter blossoms. Uh. The same favorites I enjoy as a late 20-something!